This is a experimental version of MAME 104u6. 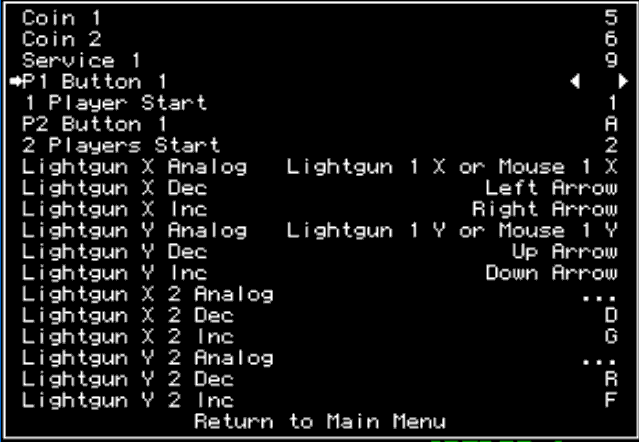 It contains code that allows you to use multiple light guns in MAME. You can use more then 2 light guns, as long as the total number of mice plus light guns does not exceed 8. This functionality only applies when running this test version on Windows XP. Older versions of Windows use the regular functionality as described in the documentation supplied with the guns. 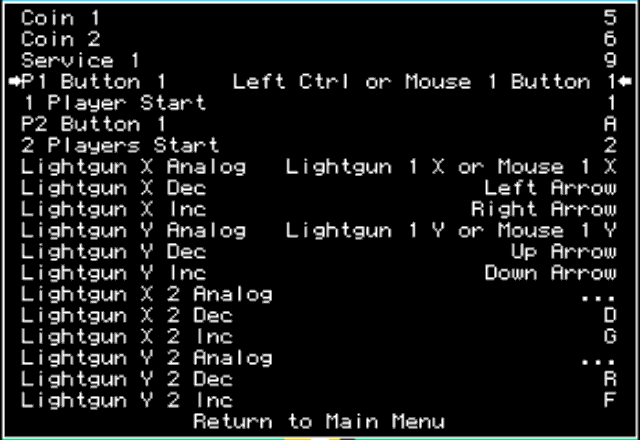 In this test version of MAME, you no longer need to use the -lightgun or -dual_lightgun commands. But you must use the -mouse command. 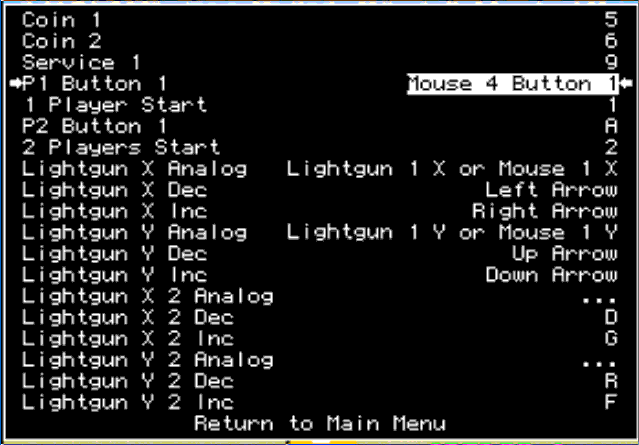 For this version of MAME, mice and light guns are considered the same. The test setup I used had 3 mice and 2 light guns. The mice are Mouse 1, 2 & 3. The light guns are Lightgun 4 & 5. This does not mean that you have 4 or 5 light guns. 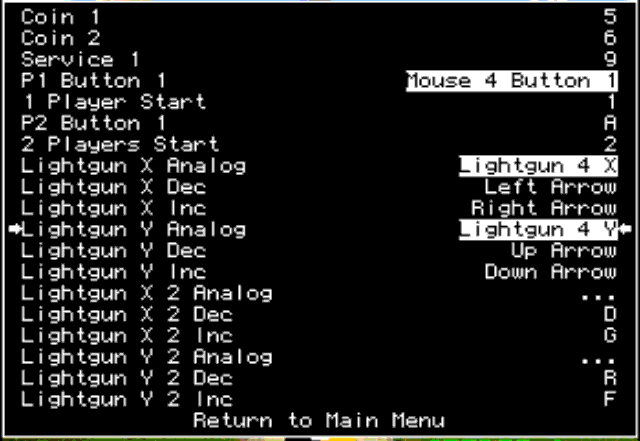 This is just the mouse position windows assigns them. 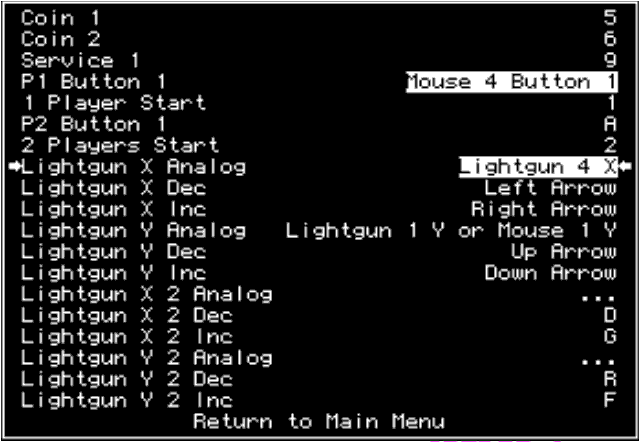 With light guns, only the X,Y axis data is different then the mouse data, so you will see the buttons reported as mouse 4 & 5 and the X,Y axis are reported as Lightgun 4 & 5. Your mouse and light gun numbers may be different then the numbers show here. 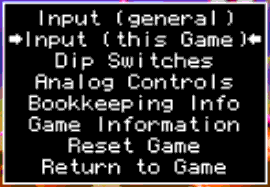 Move down so you can select the fire trigger. This is "P1 Button 1". Press the trigger button on the gun you want to use for player 1. You will now see something similar to this. It shows "Mouse 4 Button 1" instead of "Lightgun 4 Button 1". This is normal. A light gun is a mouse. Only the X,Y data is different.